3D printers are incredible machines that give designers and engineers the means to materialize practically any shape imaginable. As a result, 3D printers have swiftly been adopted into commercial production environments. With the ability to bring manufacturing processes in-house, and the ability to tweak and tinker with parts using only a few clicks of a mouse, design and production can be performed quickly and cheaply. To create 3D printed parts, two components are typically required—substrate material and heat. A substrate provides the physical structure of a part. The second component of 3D printing is heat, which is applied to melt the source material so that it can be printed into a part. Sounds easy, right? Not so fast. Hidden dangers arise during the application of heat to substrate, making the 3D printing process hazardous in an uncontrolled environment. Substrate materials are typically made from nylon, ABS or other common plastics that produce volatile organic compounds (VOCs) at high temperature. VOCs from 3D printers include harmful chemicals such as styrene (a known carcinogen) and caprolactam (an acute risk molecule). 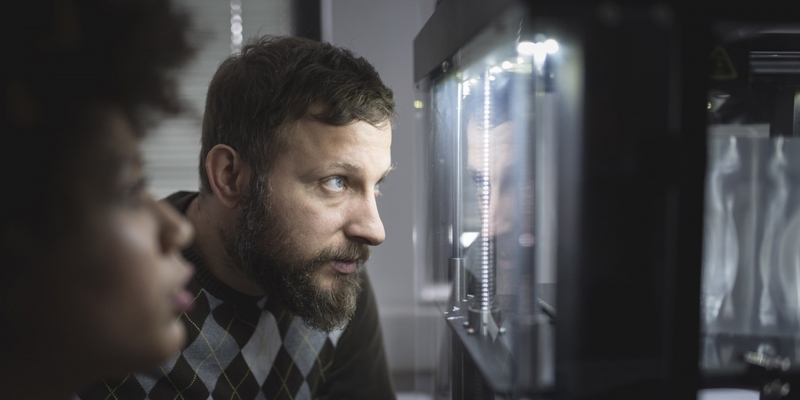 3D printers also emit ultrafine particles that are impossible to see with the naked eye. Although small in size, these particulates are particularly harmful because of their ability to get permanently stuck in the human respiratory tract. Additionally, small particulates have a larger total surface area that creates an increased physical exposure risk between body surfaces and hazardous particulate surfaces. There are two types of 3D printer ventilation hoods that can contain VOCs and particulates from 3D printers. A powder containment enclosure designed to capture hazardous particulates on an integrated high efficiency particulate air (HEPA) filter, pulls hazardous particulates away from users. Air enters the enclosure at low inflow speeds to ensure that printing accuracy is maintained while the substrate cools. When fully loaded, HEPA filters can easily be removed using the integrated bag-in/bag-out filter containment system to protect the enclosure certifier and personnel in the surrounding workspace. Light-duty carbon filters may be added to the XPert, or the unit can be exhausted, to removed hazardous VOCs. Another enclosure, the Filtered Fume Hood, pulls hazards away from operators and into Neutrodine® filters that will remove VOCs without the need for duct work. Designed as an alternative to traditional ducted hoods, Echo Hoods have large chemical binding capacities and built-in alarms that alert users at chemical breakthrough. For printer applications where nuisance particulates are emitted, the Echo may also be fitted with a HEPA filter. Have a 3D printing application that you would like to discuss with us?